At the base of the calixarene are four hydroxyl groups, arranged in either a left or right handed manner. The molecule, in other words is chiral (C4 symmetry to be precise). As a chiral molecule, it might trap left and right-handed guests in a slightly different manner (forming two possible diastereomeric host-guest complexes). As it happens, the guest in the cyclobutadiene story was just such a chiral molecule. But an essential question to ask is what the barrier to enantiomerization of such a calixarene might be? One can envisage several ways of accomplishing such a conversion. All four hydrogens can be moved in a single step, one might move two at a time in two steps, or one might move one at a time in four steps. These processes would involve respectively 8, 6 or 4 electrons in each step. There is a fundamental difference between the first pathway and the last two; the latter involve ionic intermediates (zwitterions) whereas the first is neutral. As such one might imagine the process would depend on the ability of the solvent to stabilize any such zwitterion. Let us start with a gas phase model (ωB97XD/6-311G(d,p)), and a transition state with one negative force constant is indeed found with C4v symmetry. The free energy barrier ΔG† for the process is 14.0 kcal/mol, which means the reaction will occur rapidly, even at lower temperatures of ~200K. A pack size of 8 seems preferred for this model. This is hardly a surprise since the formation of ionic intermediates would not be expected. One might however speculate thus. In the schematic above, n=1 and one might be tempted to ask if higher values of n (lets say n=2, a pack size of 10, or n=3, a pack size of 12, etc ) might exhibit similar behaviour. Is there any limit to the ring/pack size for this type of proton exchange? Transition state for enantiomerization of a calixarene in the gas phase. Click for 3D. What about in solution? Well, let us apply the mildest of solvents, benzene as a so-called continuum field. This has a very low dielectric (2.3) and you might imagine it would have hardly any effect. Well click on the below. The C4v geometry now has three computed negative force constants; the two additional ones are shown below (they are degenerate with a wavenumber of 101i cm-1). C4v symmetric geometry for calixarene in benzene solvent, with three negative force constants. Click for animation of E mode. 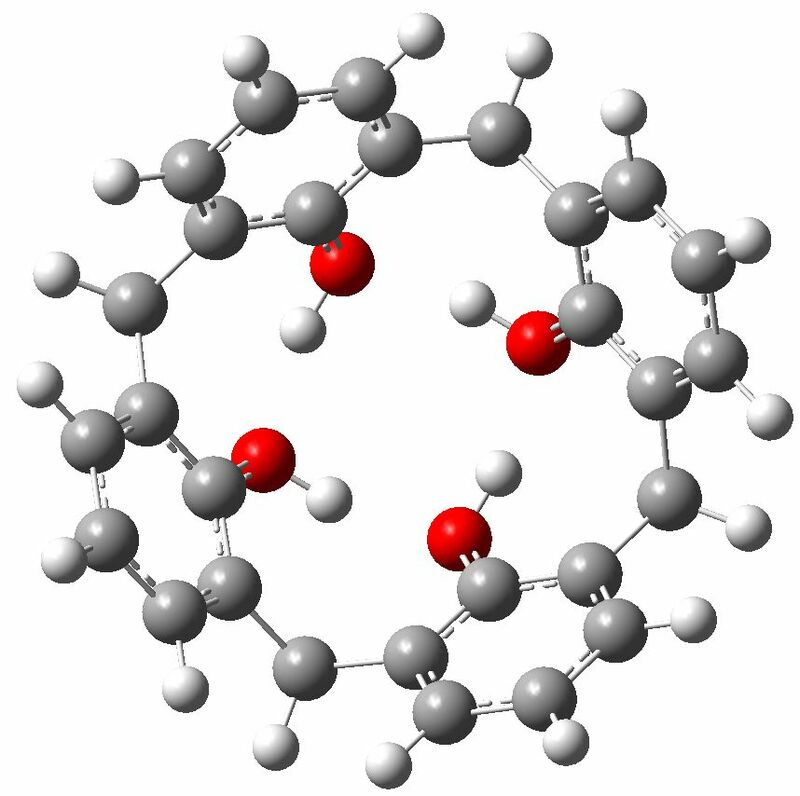 C4v geometry for calixarene in benzene. Click for animation of second E mode. So now the question is what happens when either of the two additional negative force constants is followed downhill? Will it form a true zwitterion (which would have Cs symmetry), in which case it would be (two) 6 electron processes to enantiomerize the calixarene instead of one 8 electron one. In fact this geometry of Cs symmetry, which does resemble the zwitterion shown in the scheme above, is NOT a minimum but a true transition state itself (the free energy barrier hardly changed from the value for the gas phase). 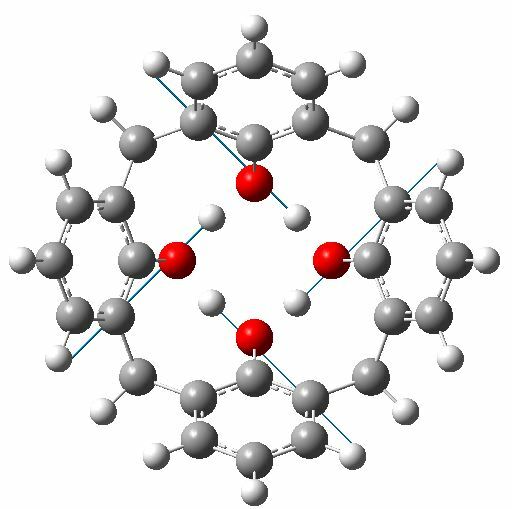 So the answer seems to be that a calixarene enantiomerizes via transition state not of C4v but of Cs symmetry, and which resembles a zwitterion but is not actually one. The 8-packof electrons was tempted to take a short rest-break on their way to shifting the four protons, but in the end did it in a single journey! 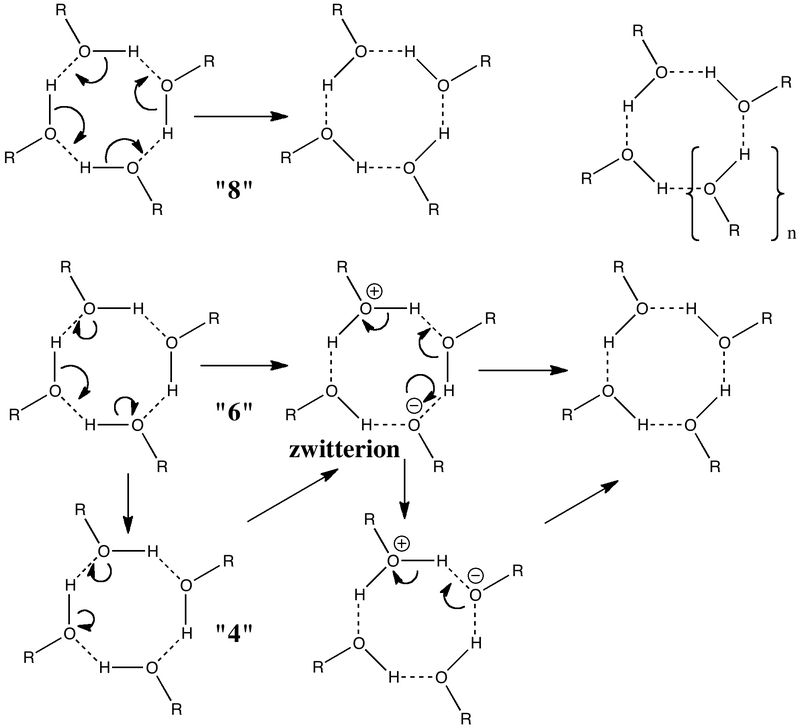 So we have an unusual zwitterionic but nevertheless concerted transition state for the process. 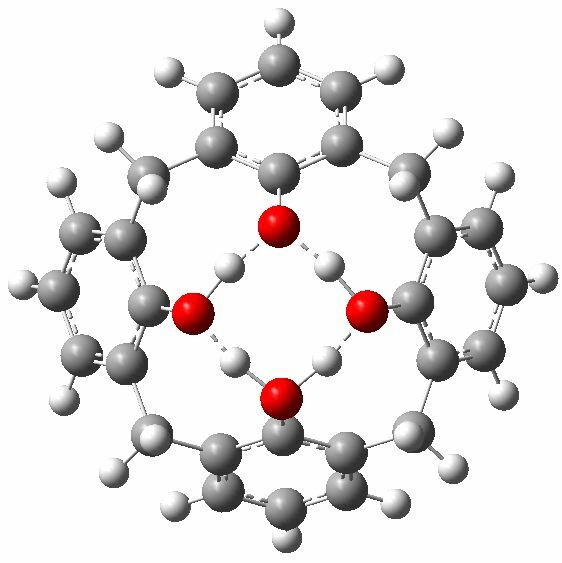 Still unresolved is whether such cyclic transfer of four protons between four oxygen atoms continues to be concerted for larger rings, or whether the system is finally tempted to break up the transfer by resting with one or more discrete intermediates along the way. 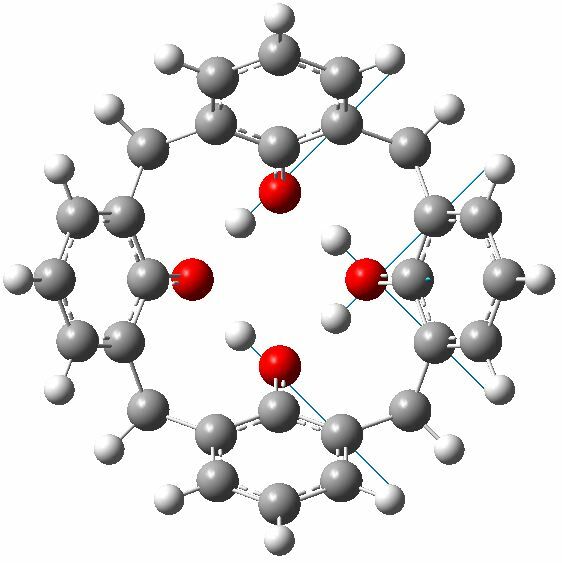 I finally note that in the calixarene reported which catalysed the thoughts above, the four oxygens are capped with a guanidinium cation sitting just above them, and this too may have an interesting effect on the proton transfer process. This entry was posted on Friday, January 7th, 2011 at 10:55 am and is filed under Interesting chemistry. You can follow any responses to this entry through the RSS 2.0 feed. You can leave a response, or trackback from your own site.